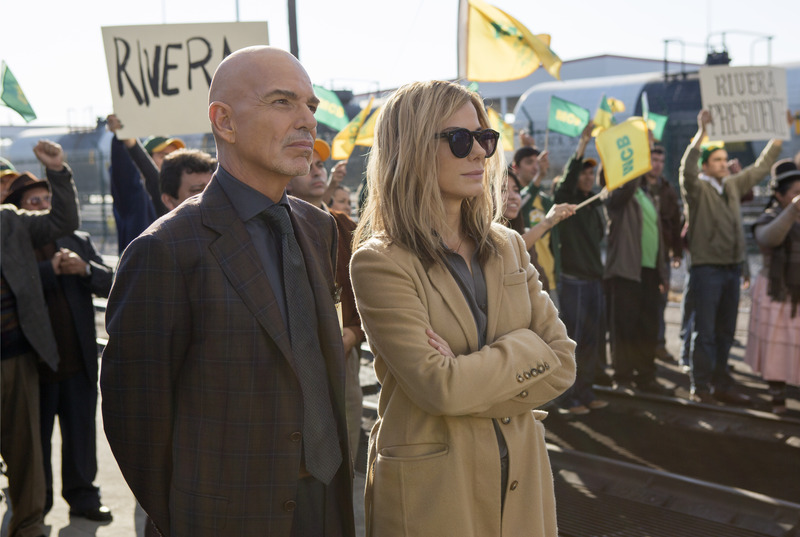 “I can convince myself of many things, if the price is right,” says Sandra Bullock’s character, “Calamity Jane” Bodine, in Our Brand is Crisis. Jane is pretty good at convincing other people, too. That’s why the formerly formidable campaign strategist is lured out of early retirement to help an unpopular Bolivian president in an upcoming election—by convincing the reluctant public, through whatever means necessary, that they should vote for him. But this battle’s not just political, it’s also personal: Bodine has to match wits with an old nemesis, Pat Candy (Billy Bob Thornton), who’s been hired to strategize for the other side. It’s based on things that went down at a real 2002 Bolivian election, which was chronicled in an award-winning 2005 documentary of the same name. Thornton’s character is a movie remold of former hardball strategist James Carville, who appeared as himself in the original film. Bullock’s character—a part originally written for a male—is an amalgam of several other actual people. Bullock and Thornton provide the movie’s real spark; it’s too bad there’s not more of it, and more of them, to help the whole thing catch fire. There’s a murky, turbulent history between Bodine and Candy that we never fully understand, just one of several things the movie doesn’t make clear. But the deft, unfussy way the two characters spar and parry, in guarded conversations and piercing silences, are artful reminders of just how these two pros can make the most of their screen time. Scoot McNairy, Ann Dowd and Anthony Mackie are also aboard as Calamity Jane’s team members. Zoe Kazan plays a young dirty-tricks research wonk brought in to turn up the heat when things shift into true “crisis” overdrive. If you’re a political junkie, this is your time of year. The presidential candidate debates make for riveting, sometimes-outrageous TV, and shows like The Good Wife, Scandal, Veep and the new Agent X take viewers inside the heated (fictionalized) heavings of Washington, D.C. Our Brand is Crisis brings up some timely points about what it takes to mount—and win—a campaign. But is anyone surprised that politics plays dirty? That strategists can be snake-oil salesmen who convince people to buy things they don’t need, to elect leaders who may not have their best interests in mind? That America exports its will and influence to other parts of the world? After her first meeting with the Bolivian president, Bodine realizes what a daunting job she signed on for, and she wearily notes that he “doesn’t smell like a winner.” Unfortunately, despite Sandra and Billy Bob, neither does this. 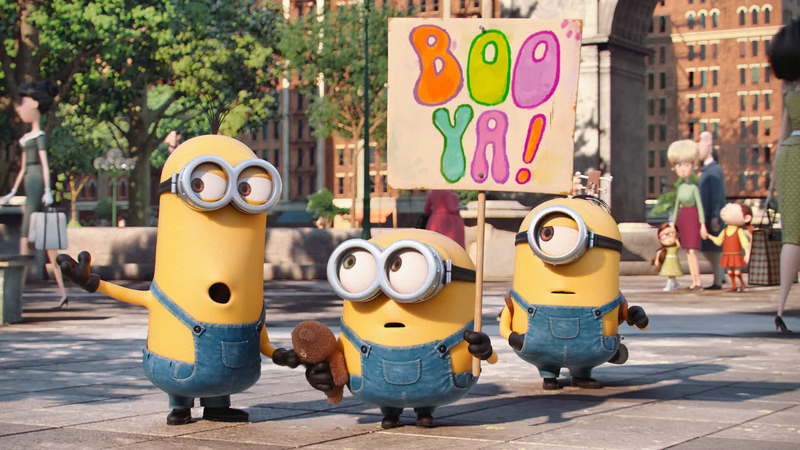 Their sideline shenanigans got some of the biggest laughs in Despicable Me (2010) and its 2013 sequel. Now the minions, those little nubby, yellow, evil-enabling assistants, headline their own madcap spinoff about their long, crazy quest to find the “most despicable master” of all to serve. And what a quest—it begins, we find out (as guided by the narration of Geoffrey Rush) in primordial ooze and quickly bops through various incidents across the centuries as the minions seek out a succession of “bad guys” from dinosaurs and Dracula to an Egyptian pharaoh, Napoleon and an abominable snowman. But they always bungle things, with comically disastrous consequences. So they keep moving, throughout the centuries and around the globe, until a trio of minion explorers (Kevin, Bob and Stuart) lands in New York City in 1968. Then things shift into comedic high gear as directors Pierre Coffin and Kyle Balda riff on the vibrant sights and sounds of the era (the movie has a killer soundtrack of groovy late-’60s tunes) and serve up a buffet of pop-cultural cleverness for all ages. When Kevin, Bob and Stuart see a late-night TV ad for Villain-Con, an upcoming Comic-Con-like convocation of baddies, they know they have to hook up with event’s headliner, the queen of mean, Scarlett Overkill (Sandra Bullock). 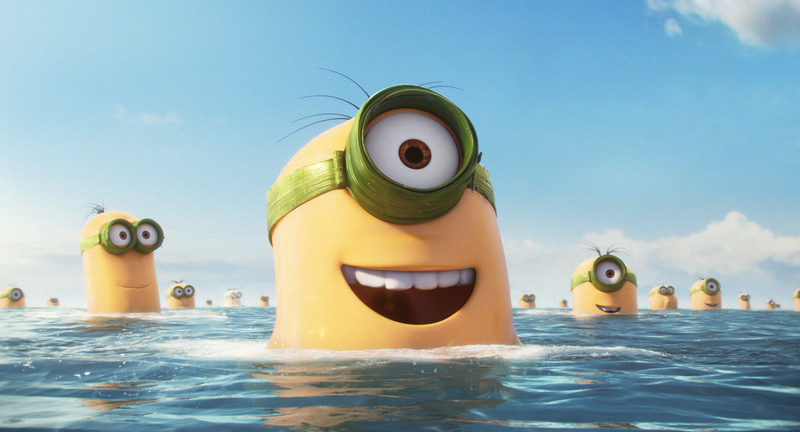 The minions have always had an instant appeal to kids, for obvious reasons: They look like wobbly toddlers, they speak gibberish (a goo-goo gush of Euro-babble, provided by director Coffin) and there’s an innate goodness and innocence underneath whatever “bad” they might otherwise be trying to do. They’re guaranteed laughs from children by just walking onto the screen. 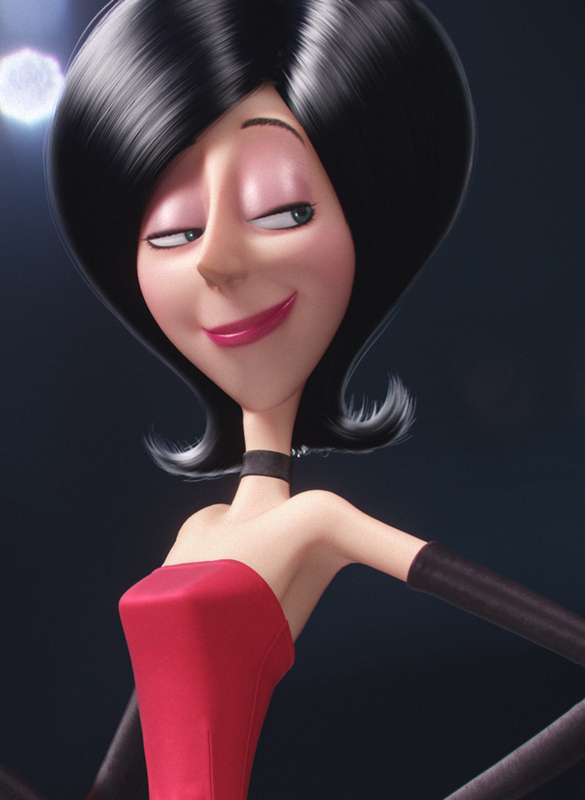 Sandra Bullock provides the voice of supervillain Scarlett Overkill. 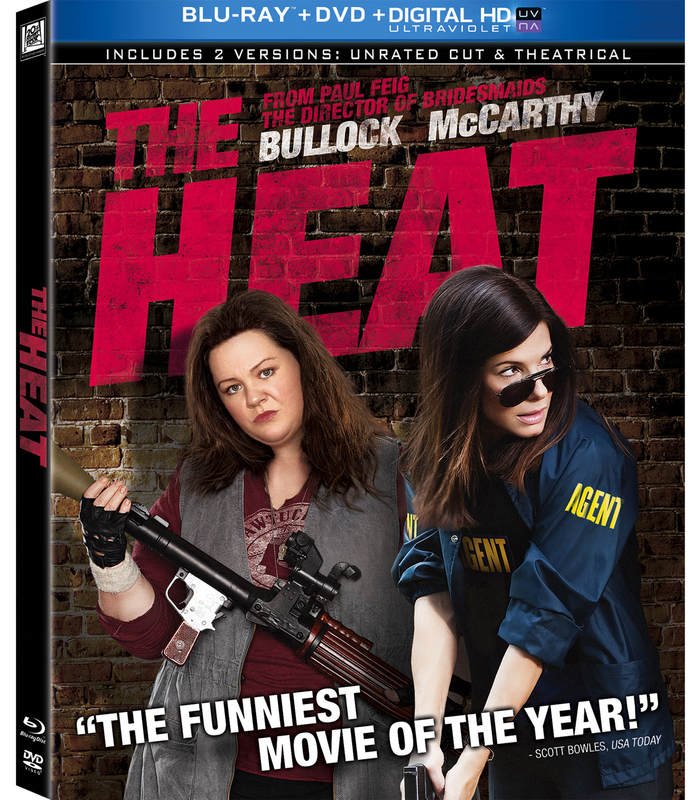 But there’s so much more to the humor here; parents will be greatly entertained by the vocal performances of Bullock as the preening villainess (which some major unresolved childhood issues); Jon Hamm as her groovy spy-gadget-guru husband; and Michael Keaton and Allison Janney as a bank-robbing mom and pop. The plot zips and zings through dozens of silly sight gags, especially when things move to England and a scheme to steal the queen’s crown. A minion on stilt-like, spy-suit extension legs runs amok in the streets of London to the tune of the Kinks’ “You Really Got Me.” Two minions flee a buzzing bee round and round on a cathedral chandelier, and with every frantic lap the fixture unscrews more and more. Rays from a “hypno hat” cause a trio of royal guards strip down to their undies—and break into a gonzo chorus from the musical Hair. The minions intrude on The Beatles’ photo shoot for the cover of Abbey Road. Stay for a closing-credits montage that brings the minions full circle with Gru (Steve Carell), their master in the two Despicible movies—and a delightful ensemble treat from the whole cast. At times it made me think of what the Three Stooges would be like if Moe, Larry and Curly were recast for the modern age as pint-size, goggle-wearing, butter-hued niblets. It may not be high humor, but boy, it sure made me laugh. 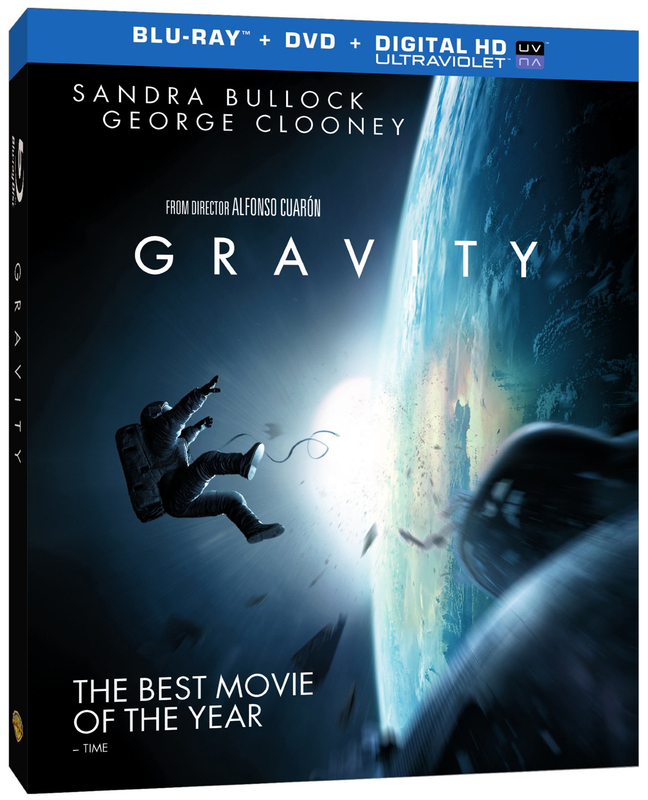 Sandra Bullock stars in this technically dazzling Oscar-nominated thriller as a NASA medical engineer thrown into a terrifying struggle to survive after her first space shuttle mission suddenly erupts in catastrophe. George Clooney’s also along for some of the ride, but this is Bullock’s show all the way as her character stares down the blackness of the cold, indifferent, infinite void of the cosmos—and wonders how she can possibly get home. Bonus content includes behind-the-scenes features, a short film by director Jonás Cuarón, and a look at the groundbreaking special effects, which create the most realistic, believable scenes of bodies and other “weightless” objects bobbing, bouncing, twirling, hurtling, and colliding ever depicted on screen. Wow—that’s the single best word I can think of to describe this truly awesome piece of moviemaking, which has instantly vaulted to the top of my list of the year’s best films. Marooned in space after the destruction of their craft, two American astronauts suddenly find themselves on a new mission of survival. That’s a simple enough premise, but Gravity turns its into something at once monumental and sublime, slicing to the core of our basic fears and primal issues about death and dying, isolation, abandonment and spiritual longing, and the general cosmic inhospitality and indifference that greets humans whenever we venture outside the comfort zone of the earthly place we call home. It’s also one of the most technically dazzling spectacles to ever grace the screen, an eye-popping, digital/live-action marvel that makes the senses reel with new levels of sophistication in its groundbreaking special effects that leave most other films looking like they’re lagging light years behind. As it begins, we meet veteran astronaut Matt Kowalski (George Clooney) and his space shuttle’s medical engineer Ryan Stone (Sandra Bullock), a newcomer on her first mission. In a breathtaking, 15-minute sequence during which the camera never breaks away, we see Dr. Stone working outside the docked shuttle on the Hubble telescope, and Kowalski whisking around leisurely with his jetpack, cracking jokes with Mission Control (voiced by Ed Harris, a nice nod to another astronaut flick, The Right Stuff), when they receive some alarming news: A shower of shrapnel from a detonated Soviet satellite is speeding directly at them, at 25,000 miles per hour. But the warning comes too late: The cloud of space junk, catapulted by centrifugal force as it orbits the Earth, plows into the shuttle, rendering it useless—and sending Dr. Stone flying out into the inky, star-flecked blackness, adrift, detached and alone. Back in 2006, Cuaròn made critics giddy with the tracking shots he used in Children of Men, a grungy futuristic fable that became known for a couple of lengthy, carefully executed segments in which the camera stayed with the action and characters, without cutting away, for several long, protracted moments. Those shots were über-cool, but they’re nothing compared with what the director pulls off here, in which his camera goes places, and does things, that are nothing short of jaw-dropping. This is one of Bullock’s best performances, without a doubt; reserve her a seat down front now at this year’s Oscars. It’s one of the most dazzling-looking films you’ll ever have the opportunity to see, especially if you see it in 3-D, or better yet, in 3-D and IMAX—believe every bit of the hype. 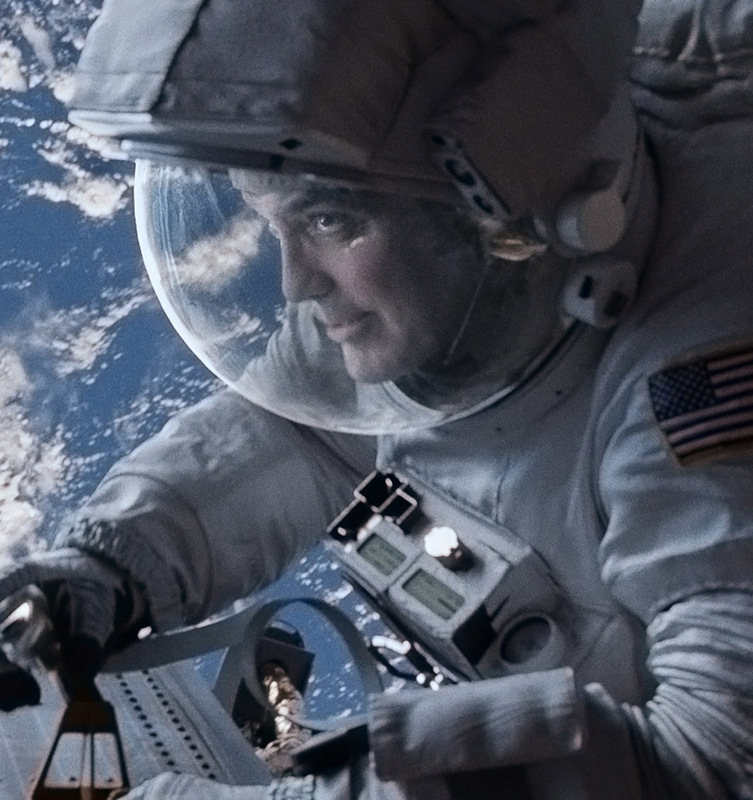 It’s a masterful achievement of technique and craftsmanship, creating what has to be the most realistic “in space” experience ever for any motion picture. And its final scene is a brilliant cinematic brushstroke of pure movie poetry that blends heaven and Earth, rebirth and renewal, past, present and future, and a poignant reminder of the Newtonian universal constant from which the film takes its title. In almost every way, Gravity is out of this world.